What is more lovely than the citrus smell of clementines! This beautiful winter fruit is constantly in my fruit bowl this time of the year and today they were calling to me to make them into something more. Something that will explore their intense pure flavor and scent. So with much creativity in the kitchen this morning, I give you my winter dessert spectacular, Clementine Tarts with Clementine Ginger Cream on top of Citrus Macaroon Cookies! In a Magic Bullet using the flat blade or blender, blend the clementine segments with the ginger. Add the rest of the ingredients and blend until completely smooth. Empty into a small bowl, cover with plastic wrap and let set in the fridge. In a medium size bowl mix the coconut, cashews and zest together with a spatula. Add the rest of the ingredients and continue blending until completely incorporated. Dump the cookie dough in the middle of a 1.5 foot of wax paper on a flat counter top. Using your hands or the spatula press and smooth over the dough to make a flat even surface about 1/4 inch thick. You can also put another sheet of wax paper over the dough and roll a rolling pin over for a completely flat surface. Using a 2.5 inch (6 cm) cookie cutter that is lightly wiped with coconut oil, cut out shapes out of the dough. Fold the sides over of the wax paper to cover the dough and place on a flat surface or on a cutting board in the freezer for 15 min. Once the cookies have hardened use the cookie cutter once move to loosen the cookie and remove it from it’s place with a spatula. Set on another wax paper and set back in the fridge until just about to serve. With the remaining dough, let it sit on the counter for 5 min or until it is soft and repeat the steps as before to create the flat cookie. Place the remaining cookies with the other in the freezer. 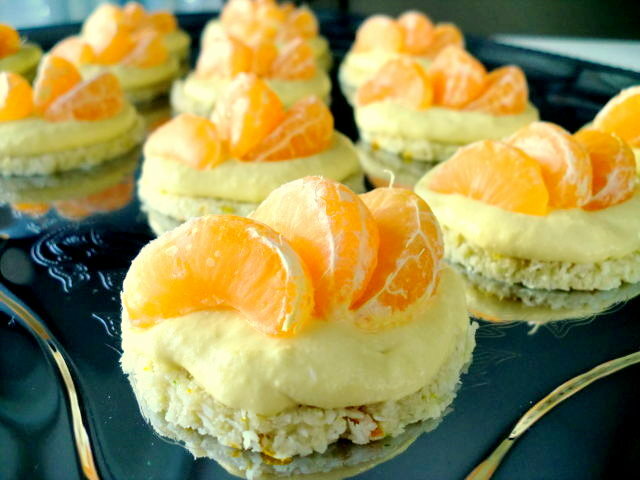 Once you are ready to serve, place the Citrus Macaroon Cookies on silver or decorative flat platter. Spoon about 1.5 tbls of the Clementine Ginger Cream over the top and add 3 de-seeded clementine segments to the top. Serve and enjoy immediately! This entry was posted on December 12, 2010 by Olive. It was filed under Raw Food . I love Clementines! I can never have just one! This looks great! They are so lovely, Carla! Thanks for posting another beautiful, sweet recipe! I am sure I will enjoy eating it too. Happy Holiday to you and your family!! I have a Christmas cookie exchange this coming Monday and I think I will be making these! They are so cute and look pretty simple and delish. Oh my, the photo’s of your creations just get the drool rolling. Can’t wait for Santa’s helper to cook for me over the holidays. That’s it! You must think of a delivery service for your delectable treats! If they can deliver pizza, there must be a way to deliver ‘raw food deserts’…please, please, please! I can tell you – it looks exactly delicious as the taste is. I was just wondering if I am supposed to use soaked cashews? No need to soakd the cahsews before!